Taipei, Taiwan, December 7, 2015 – QNAP® Systems, Inc. has further improved its HybridDesk Station (HD Station) 3.0 app by integrating the renowned JRiver Media Center, providing users with better audio experience and greater choice to complete their home theater environment. With the exclusive QvPC Technology, QNAP NAS can be used as a PC and run multiple applications on the HD Station by simply connecting a keyboard, mouse and HDMI display. “We are happy to work with QNAP to enrich the multimedia applications on their NAS devices. 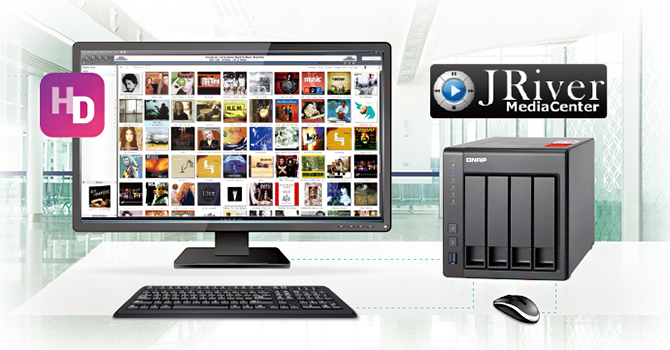 JRiver Media Center provides excellent media management and works perfectly in QNAP’s HD Station to provide users with greater flexibility in their multimedia experience,” said Jim Hillegass, CEO of JRiver, Inc.
With JRiver Media Center in the HD Station, users can manage a large library of media files and multiple media servers within the same network. The Media Center features cover art and metadata options to make media management extremely easy. QNAP NAS can be used as a powerful media player that supports flawless direct-streaming of every multimedia format as well as multi-zone multimedia streaming. Professional media functions including equalizer, tempo, pitch and sample rate further fulfill audiophiles’ tastes. QNAP’s QvPC Technology consolidates a number of high-end technologies including HDMI output, multimedia transcoding, Virtual Machine (VM) integration, cloud integration, NAS connection technologies, and more. QvPC enables users to use their NAS as a PC by connecting it to a HDMI monitor and using HD Station to operate multiple applications, making the QNAP NAS a cost-efficient all-in-one NAS device. For more information regarding the full QNAP NAS lineup, please visit www.qnap.com.